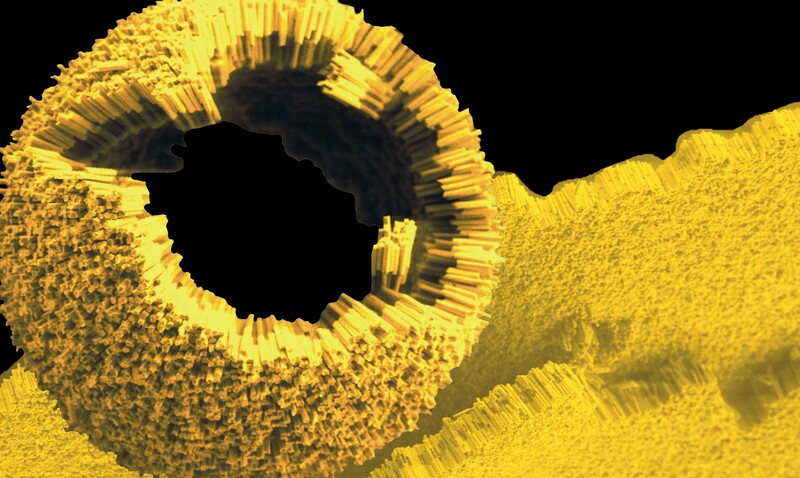 Self-assembly of Gold-polymer Nanorods. Credit: Chad Mirkin. The new book Films from the Future: The Technology and Morality of Sci-Fi Movies has a lot to say about the challenges of getting advanced technologies right. But it also explores a number of emerging areas of science and technology. When the movie Jurassic Park was released in 1993, the potential of genetic manipulation — rewriting the “code of life” — was just beginning to become apparent. Yet the possibility of bringing back whole species from the dead was still so audacious that it lay firmly in the realm of science fiction. Today, even though the challenges remain substantial, breakthroughs in DNA sequencing and synthesis are bringing what was once fanciful within the reach of scientists and engineers. Today, complex systems are a whole area of study, as scientists, engineers and others grapple with interconnected systems that defy simple analysis, and whose behavior is not easily predicted from simple assumptions and models. Yet today’s work around complexity has its roots in the field of chaos and “strange attractors” going back to the 1950's. With the advent of the Internet of Things and widespread connectivity, never before have organizations had so much information about individuals’ lives. This data can and is being used for good — improving health and wellbeing for instance, and helping ensure that the places we live serve our needs better. But as we’re learning, it also makes people vulnerable as corporations, government, and others know enough about them to control their lives in new ways. I recently conducted an informal poll in my undergraduate class of how many of them sometimes use so-called “smart drugs.” Over 50% of the class admitted to using substances like Ritalin, Adderall and Modafinil. As the science of how the brain works advances, and the ability to synthesize substances that affect this continues to grow, smart drugs and “nootropics” are becoming an increasingly important topic. “In 2004, the academic and medical doctor Anjan Chatterjee wrote a review of what he termed “Cosmetic Neurology.” He was far from the first person to write about the emergence and ethics of cognitive enhancers, but the piece caught my attention because of its unusual title. Smart drugs and artificial intelligence are based on assumptions around what intelligence is, and its usefulness. But as these and associated technologies continue to advance, we’re learning that we need to think more deeply about the nature of intelligence. “In 2016, a quite remarkable series of images started to permeate the internet. The images showed what looked like the perfectly formed outer parts of a human ear. But, unlike a real ear, this one was emerging, as if grown, from an iridescent pink liquid held in a laboratory petri dish. Automation has been at the core of technology innovation since the Industrial Revolution. Yet advances in robotics and artificial intelligence are promising (or threatening, depending how you look at it) a step-change in the level of automation within society, from manufacturing to transportation, and even teaching, investment, and law enforcement. It’s a wave of technological innovation that’s as challenging as it is exciting. Technologies have been used to augment our bodies for centuries — just think of glasses, or false teeth. Yet the technologies we embed in our bodies are becoming increasingly sophisticated. And as they do, they are raising quite amazing new possibilites, as well as some quite novel challenges. Without a doubt, technologies like deep learning and natural language processing have revitalized the field of artificial intelligence, to the point where massive breakthroughs are being made in what machines can achieve, and how they can transcend human capabilities. Whichever way AI goes, the one certainty is that the future with AI will be very different from the present. Emerging technologies in biology, cyber tech and materials are radically changing what it’s possible to achieve. But it’s at the convergence of these trends that the most profound shifts in capabilities are occurring. Nanotechnology — or to be more precise, nanoscale science and engineering — has been around for a while now. But as scientists and engineers learn more about how the precise arrangement of atoms and molecules in materials affects their properties, we’re getting closer to creating materials that behave quite unlike anything that’s existed before. “As scientists began to understand how particle size changes material behavior, they began developing increasingly sophisticated particle-based catalysts that were designed to speed up reactions and help produce specific industrial chemicals. But they also began to understand how the precise atomic configuration of everything around us affects the properties of materials, and can in principle be used to design how a material behaves. One of the advantages of breakthroughs in DNA sequencing and synthesis is that scientists can begin to experiment with existing organisms, and ask “what if …” questions about their genetic code. One particular question along these lines is “what if we make a virulent pathogen even more virulent …” It may seem like an odd question, but this so-called “gain of function” research is helpful in understanding the emergence of deadly viruses and other pathogens, so that we can prepare for them. However, it also raises the possibility of someone doing the same to unleash a deadly infectious agent into the world. We live in world that seems to be changing faster by the day — whether it’s through climate change, social change, or the ever-increasing speed of innovation. To survive and thrive in such an environment, we need to embrace ways of managing and adapting to change. And this means developing an increasingly sophisticated understanding of what it means to be resilient. How do you separate exciting but fanciful new technologies from those that are likely to succeed? The same goes for scientific breakthrough, and sifting through the hype that often surrounds them. here, the concept of “Occam’s razor” may be helpful in making sense of grandiose claims and fearful projections. If life is ever discovered that didn’t originate on Earth is ever found, it could be a game changer. Or it could simply be a “meh” moment as people pause in their daily routines, then get on with life as usual. Either way, breakthroughs in space science are dramatically increasing the odds of finding something, somewhere in the universe, that didn’t evolve on Earth.